It’s Monday morning and you have nothing on the calendar for days. You know you should “prospect” Expireds and FSBOs, but you don’t want to. You have all heard the success stories, but the thought of “cold calling” another person from a list makes your chest tighten and you throw up a little in your mouth. Trust me, we are right there with you and so are many agents around the country. That is why less than 10% of agents actively prospect on a regular basis. Most people don’t like making the calls, nor do most people like being called. So what do we do? It is time to think about prospecting differently. 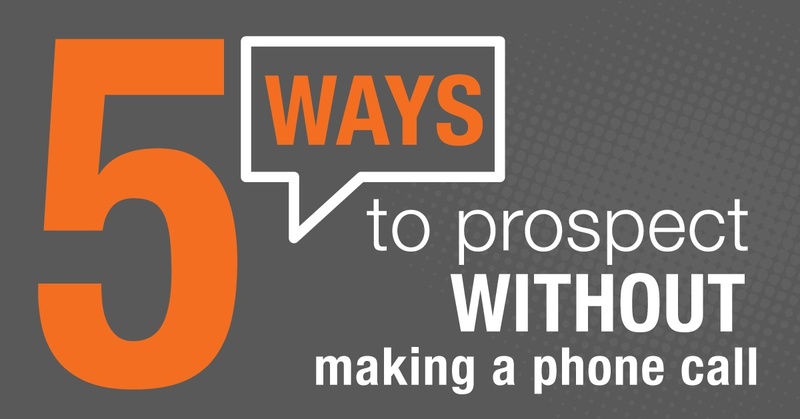 Here are 5 easy ways you can “prospect” Expireds and FSBOs WITHOUT having to make a single call. A recent stat showed that 90% of texts are read within 3 minutes. That shouldn’t be too shocking to anyone. You know you live on your phone, and so do most of your potential customers. Simply send a quick personal greeting with a link to your website, social media, or a video (see #2). Be sure to keep it short and clearly introduce yourself as a real estate agent. Your lead provider should be providing you cell phone numbers, if they are not you should switch to Landvoice, we provide up to 95% of numbers with our Expired Pro service. Do you have the homeowners email address? Send them a personal email message with brief introduction and some helpful links. Write 3 or 4 base messages to use with FSBOs, Expireds, and other prospects that you can quickly modify for each person. Many agents are having huge success when they include a short video. You don’t need to hire a video crew. You have everything you need in your pocket, your mobile phone. All you need to do is simply introduce yourself and offer to help them discover the value of their home. There are even companies, like our friends at Bomb Bomb, that make it super easy to record, send and even track these videos. Landvoice also has videos to help you explain how you can help. Remember to always include a CTA (Call To Action) in all your messages and marketing. At a minimum invite them to call or text you at anytime with questions. Did you know you can easily find “Friends” on Facebook? Use the Search for Friends option where you can enter the name of the homeowner. Then you can filter by town, and a host of other options. Facebook moves this feature around from time to time, but today if you go to Friends, then Find Friends, then the search box is to the right. Once you find the homeowner you can send a personal message to them with links to your website, videos, and other helpful information. Don’t forget the CTA. Landvoice has a service that can add email addresses and links to social profiles to your leads to make this easier. You know, the stuff with a stamp that the mail carrier delivers right to your prospect? You're right, this is old school. But it works when done deliberately and consistently. There are lots of approaches (and instructions online) for what you can or should send to people in the mail. The options range from postcards, hand written letters, invitations to a helpful seminar or to a special neighbor preview of nearby open houses, local sports team schedules, recipes, top 10 lists, market updates or comparisons, greeting cards, recent listings or sold properties, small dollar amount gift cards for coffee or movies, and the list goes on and on. The goal is to send them something they will find interesting and valuable that will begin to establish you as the local expert. TIP: make sure your lead provider is providing you with the actual address of the homeowner and not a tenant or the previous listing agent. This is also nothing new but it works so well. You get to look them in the eyes, ask them good questions and LISTEN. This simple, real human interaction is still a great way to begin a relationship. TIP: If this is an expired, they just broke off a relationship that they hoped would lead to selling their largest asset. They don’t want to be lectured to about how much better you think you are than everyone else. They don’t want to see your 52-point marketing plan. They need to be heard. At least that is what my wife says. Ask good questions like; how are you feeling about the market right now? What are you worried about? What do you think went wrong? If they are not home, be prepared to leave something behind to let them know you stopped by. Remember, prospecting is just relationship building and it doesn’t have to be hard. Also, don’t give up on phone calling prospects. It still works very well for many agents. Keep working at it, but in the meantime, you can prospect without ever dialing a single number. And, as always, follow the specific guidelines for your MLS and area. Until next time, cheers to your abundance. If you have more ideas about this, use the comment section below.